christmas eve day was spent last minute shopping/wrapping- i'm bad, i know! this included a new pair of shoes for me- merry christmas, self! 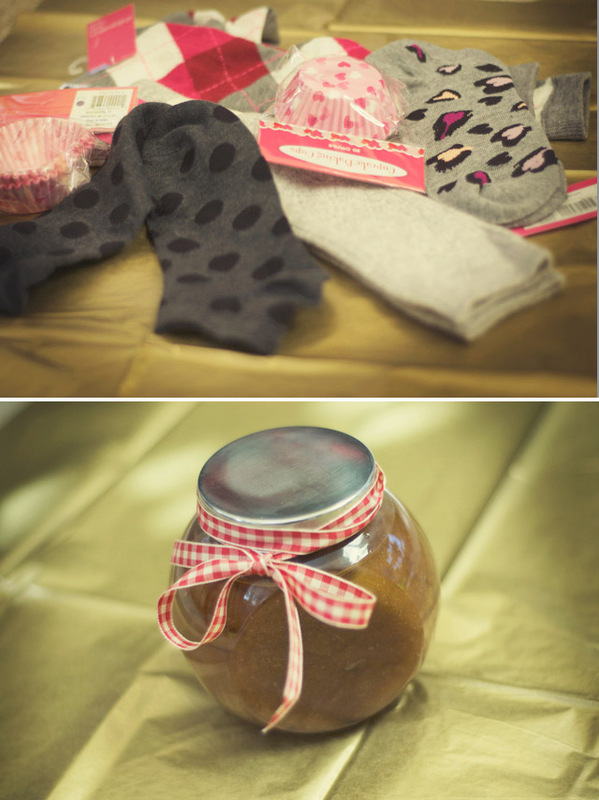 plus fun socks + cupcake liners for my boyfriends sweet little sisters! ^^remember this? d.i.y peppermint brown sugar body scrub for my cousins! christmas eve night was spent at my aunt's house with all (15+) of my cousins. meaning lots and lots of food- funny how out of all these pictures the only thing i actually ate was the bread (i'm super picky!) call me crazy...and then i'll call you crazy..it'll never end! regardless, they look pretty in pictures right?! hope you had a merry everything!! Okay, so I'm pretty much addicted to those dollar target socks I see above! I love! Gorgeous black pumps and beautiful smile! I'm glad you had a great Christmas! I love your shoes and all that food looks delish! I just ADORE your blog!! Loving all your photos and simple DIYs!! Love love LoVe! :) glad you had a merry Christmas! I just found your blog and oh my am I glad I did. Seriously I've been following for a total of 15 minutes and I'm already in love. It looks like you had a fantastic Christmas as well! I think I might have to try out that DIY body scrub too! Your food pictures are making me hungry, and I just had breakfast. :P Also, I love your black shoes. awww pretty-pretty things! happy holidays to you! have a great new year!